Following Friday's global beatdown when the 3M-10Y yield curve inverted for the first time since 2007, launching the countdown to the next recession, optimism was scarce to start the week as European shares slumped, S&P futures pointed to another day of fighting the gravitational attraction of 2,800 and Asian stocks tumbled, even as a glimmer of hope emerged in Germany where the IFO index beat expectations, helping push Treasury yields higher and the bund briefly rose above 0.00%. The session started on the back foot, with the MSCI Asia Pacific index tumbling 2%, its biggest drop of the year, as regional stocks tracked Friday's heavy Wall Street losses, and Japan’s Nikkei hit a five-week low after diving 3.1 percent for its largest one-day percentage fall since late December. South Korea’s Kospi index declined 1.7 percent, while China shares was also in the red with the blue-chip CSI 300 index down 1.4 percent. MSCI’s gauge of stocks across the globe slipped 0.5 percent. The gloomy mood was expected to spread to U.S. markets with S&P 500 futures skidding 0.2 percent. However, they were down as much as 0.5 percent earlier in the day. 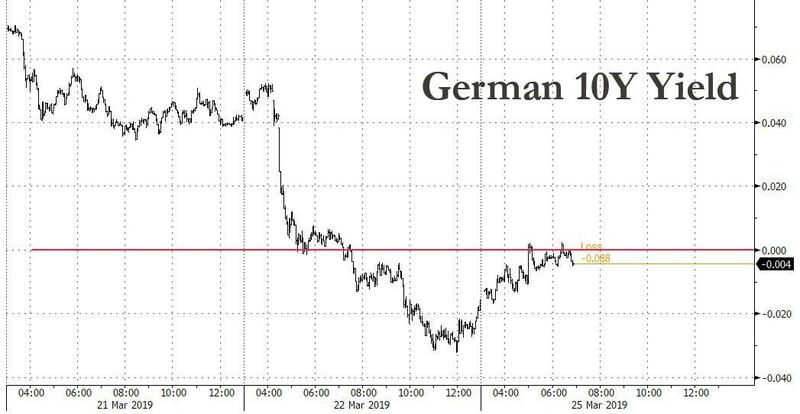 ... soothing nerves after Friday’s dismal German manufacturing data, which helped spark a global selloff that hammered stock markets and pushed key benchmark bond yields below zero. Whereas the much discussed inversion in the 3M-10Y yield curve - the Fed's favorite leading recession indicator - on Friday stoked fears that the world’s largest economy was headed for recession, the Ifo report lent some cheer. It helped European shares - where tech shares led declines - rise off early lows. Paris traded flat, London’s FTSE was down 0.2 percent, and Frankfurt inched up 0.14 percent after the numbers. Europe’s banking as well as industrial goods & services sectors which were down 1 percent at one point, recouped losses to trade flat. But the jitters are far from over. Futures on the S&P 500 Index decreased as much as 0.5 percent to the lowest in almost two weeks, before rebounding and hugging the 2,800 "sextuple top." Meanwhile, the flight to safety continued around the globe, with Australia’s 10-year bond yield sliding to an all-time low and Japan’s hit the lowest since September 2016. “Global equities were kind of complacent” as rates markets reflected growth concerns, said Marcella Chow, global market strategist at JPMorgan Asset Management in Hong Kong. “It was the release of global PMI data last Friday that shook off the complacency,” she added. The glimmers of German economic optimism helped push spreads between U.S. three-month and 10-year Treasury yields positive. U.S. 10-year treasury yields stood at 2.47% after yields inverted for the first time since 2007 on Friday: historically a failsafe harbinger of upcoming recession. “The bond market price action is an enormous blaring siren to anyone trying to be optimistic on stocks,” JPMorgan analysts said in a note to clients. "Growth, and bonds/yield curves, will be the only thing stocks should be focused on going forward, and it’s very hard to envision any type of rally until economic confidence stabilizes and bonds reverse." "We had a dire end to 2018 which was then recouped so you have a very good reason to lighten up on portfolios," said Marie Owens Thomsen, chief economist at CA Indosuez in Geneva, adding that confusion over the state of play in Britain’s impending departure from the European Union clouded the picture more. "Many people may have realized a major part of their expected returns for the year, so in light of recent gains it makes sense for investors to should lighten up on risk." And while investors also digesting news that Special Counsel Robert Mueller found no evidence anyone close to President Donald Trump colluded with Russia in the 2016 presidential campaign, judging by the lack of notable reaction the news did not come as much of a surprise to traders. While Mueller failed to exonerate Trump on obstruction of justice, Attorney General William Barr said he did not find enough evidence to pursue that charge. In overnight central bank news, Fed's Evans (voter, dove) said the US economy is in a strong position and that it is a good time to pause and be cautious, while he added that US monetary policy is currently neither accommodative or restrictive. Evans also commented they will take action if inflation undershoots, while he wants to see more inflation and does not expect a rate hike till H2 next year. Adding they may have to ease if economic activity weakens more than expected and that the recent US data has been softer than expected. Fed’s Harker (non-voter, dove) said economic risks tilt very slightly to the downside, and that outlook is pretty good. He reiterated the Fed’s wait-and-see stance whilst stating he favors one rate hike at most this year. He noted inflation is around the Fed's target, is edging slightly downward. Finally, he expects GDP slightly above 2% in 2019, returning to around 2% trend level in 2020. ECB's Rehn said Brexit is the biggest threat to Euro zone in the short-term and that markets are underestimating the risks, while he added Euro zone growth has slowed significantly and that we must be concerned. ECB's Hansson says that the Euro-area slowdown may continue in the medium term; tiered deposit rate has not really been discussed. QE could be restarted in event of major shock. Political turmoil in Britain over the country’s exit from the European Union also remains a drag on risk assets. Prime Minister Theresa May held crisis talks with senior colleagues and hardline Brexiteers on Sunday trying to breathe life into her twice-defeated European divorce deal after reports her cabinet was plotting to topple her. Rupert Murdoch’s Sun newspaper said in a front page editorial May must announce on Monday she will stand down as soon as her Brexit deal is approved. The British pound was 0.2% lower after three straight days of wild gyrations. The currency had slipped 0.7 percent last week. Elsewhere in FX, the Turkish lira, which crashed on Friday, recouped some of its losses which followed the start of an investigation by Turkey’s banking regulator into JPMorgan Chase and another probe of unspecified banks for stoking the currency’s plunge. 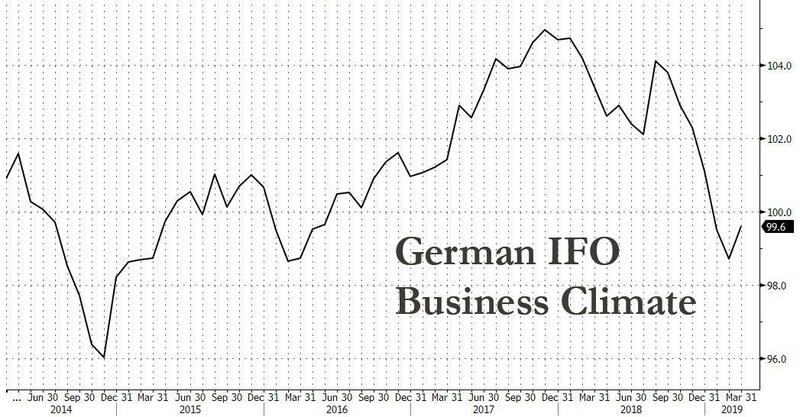 The Bloomberg dollar spot index was steady while the euro rose to a session high, European stocks bounced from a session low and the 10-year Bund yield climbed back above zero percent after stronger-than-forecast German Ifo business confidence, alleviating some fears of a sharp economic slowdown. Sweden’s krona led gains among Group-of-10 peers as it recovered some of the sharp losses on Friday while the yen led declines, after earlier touching a six-week high, as an earlier haven bid faded while Japan’s bonds rallied and 10-year yields fell to the lowest since 2016. In commodities, WTI (+0.1%) and Brent (-0.1%) futures rebounded off lows amid an improvement in risk-appetite with the former flirting with the USD 59.00/bbl to the upside whilst the latter resides just below the USD 67.00/bbl level. The latest CFTC data also showed that speculators increased next longs in NYMEX WTI by over 54k lots with a bulk of this increase driven by fresh positions. Elsewhere, Chinese crude imports increased by 2% in February to average around 10.3mln BPD, with a Y/Y increase of just under 22%. Furthermore, the country increased its share of Iranian and Venezuelan imports over February. Economic data include index readings on manufacturing and national activity. Red Hat is due to report earnings. Asian equity markets began the week with hefty losses as the region followed suit to the stock sell-off last Friday on Wall St where disappointing PMI data from both sides of the Atlantic added to slowdown concerns, while curve inversion in which yields on US 3-month T-bills rose above 10yr yields for the first time since the GFC also stoked recession fears. 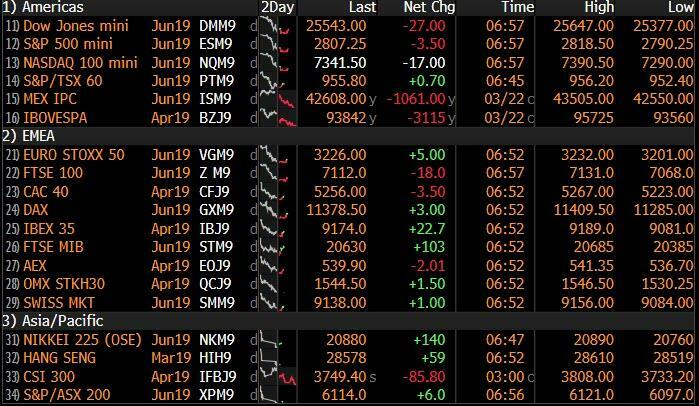 ASX 200 (-1.1%) and Nikkei 225 (-3.1%) declined from the open in which Tech and Energy led the broad losses across the sectors in Australia, while selling in Tokyo was exacerbated by flows into JPY which dragged the local benchmark below the 21,000 level. Elsewhere, Hang Seng (-2.0%) and Shanghai Comp. (-1.9%) conformed to the negative tone as participants digested a slew of earnings and after PBoC inaction resulted to a CNY 60bln liquidity drain, with oil names among the worst hit following a recent slip in crude prices. Finally, 10yr JGBs were underpinned by safe-haven demand and as yields tracked the declines in global counterparts to push the 10yr JGB yield to its lowest since September 2016 and 30yr JGB yields to its lowest since November 2016. European equities kicked off Monday trade mostly lower [Stoxx 600 -0.2%] following a dismal lead from Asia wherein the Nikkei 225 shed 3.0% and closed below 21,000 for the first time in over a month. Back in Europe, stocks have somewhat nursed opening losses as sentiment improved following a better-than-forecast German Ifo Survey which aided the DAX (+0.1%) climb into positive territory. Elsewhere, Italy’s FTSE MIB (+0.4%) is marginally outperforming its peers as Fiat Chrysler (+3.3%) supports the index amid reports its chairman is pushing for a tie up with a rival, Peugeot (-0.7%) has been touted as a potential suitor. Sector-wise, IT names are underperforming, in-fitting with the sector’s performance overnight, whilst the consumer discretionary sector is buoyed by the overall positivity in auto stocks. Finally, this morning saw a LVMH (-0.5%) open lower by just under 9% and immediately pared losses with traders citing a potential “fat-finger” incident. In FX, the Euro was not the biggest G10 mover or best performer, but the single currency has staged a firmer recovery rebound from sub-1.1300 lows vs the Dollar in wake of an encouraging Ifo survey, with beats on all 3 key metrics compounded by upward revisions to the previous month across the board. Hot on the heels of last Friday’s dire Eurozone preliminary PMIs, and an especially worrying German manufacturing print, the institute contends that the bloc’s number one economy is displaying relative resistance, and this has helped to dispel some concerns about a deeper slowdown, or even recession. However, Eur/Usd has not clearly breached upside technical resistance in the form of the 30 DMA that comes in around 1.1321. SEK/NOK - The Scandi Crowns are back on the front foot and leading the major league, with the Sek especially buoyant on a mixture of improving risk sentiment, bullish technicals and the Riksbank maintaining repo rate guidance for further tightening. Eur/Sek is back down below 10.4500 and Eur/Nok is eying bids/support at 9.6500 against the backdrop of oil prices trying to recover some poise after their end of week rout. AUD/NZD/CAD - All firmer vs their US counterpart after sharp underperformance last Friday when aversion was rife and safe-haven positioning escalated. Aud/Usd is back within striking distance of 0.7100 and Nzd/Usd is not too much further from 0.6900 even though Aud/Nzd has crossed 1.0300 from its latest decline through the big figure, while Usd/Cad is hovering near the bottom end of a 1.3445-05 range, as the Loonie also derives some underlying support from the aforementioned bounce in crude. JPY/GBP/CHF - Usd/Jpy has bounced from overnight safe-haven lows in line with the gradual improvement in risk appetite and through heavy 110.00 option expiry interest at the round number (2 bn), while Cable also looks unlikely to test expiry interest or hedges at the 1.3200 strike (1.6 bn) given ongoing/heightened Brexit jitters that have pulled the Pound down towards 1.3160 and close to 0.8600 vs the Euro (Ifo also impacting this pair). Similarly, the Franc has unwound some safe-haven premium towards 0.9950 against the Greenback from circa 0.9933 at one stage and 1.1250 vs around 1.1223 against the single currency. 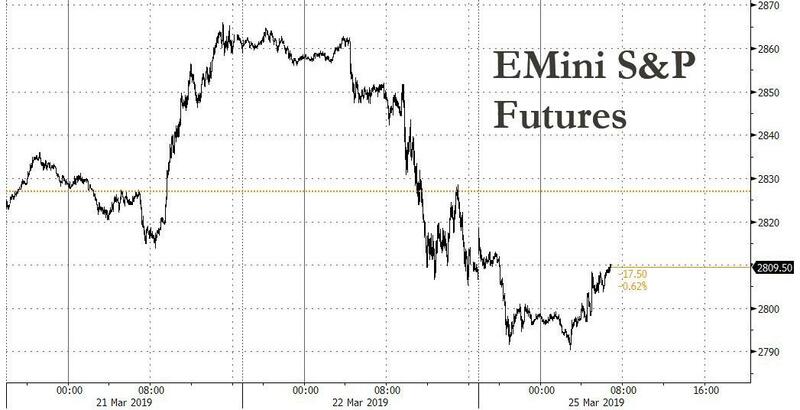 EM - Yet more thrills and spills for the Lira after official intervention against a big US bank that put out a bearish trade recommendation on the Try, and the CBRT’s decision to double swap limits on outstanding FX maturities after shelving 1 week repos. Usd/Try currently at 5.6400 within a 5.7700-5.5700 band. In commodities, WTI (+0.1%) and Brent (-0.1%) futures have rebounded off lows amid an improvement in risk-appetite with the former flirting with the USD 59.00/bbl to the upside whilst the latter resides just below the USD 67.00/bbl level. The latest CFTC data also shows that speculators increased next longs in NYMEX WTI by over 54k lots with a bulk of this increase driven by fresh positions. Elsewhere, Chinese crude imports increased by 2% in February to average around 10.3mln BPD, with a Y/Y increase of just under 22%. Furthermore, the country increased its share of Iranian and Venezuelan imports over February. Metals are largely on the front foot with gold (+0.4%) gaining further ground above USD 1300/oz with the recent fears surrounding and inverted yield curve between the US front-end and 10yr (Note: this has reversed) prompting additional demand in the yellow metal. Elsewhere, the twin cyclones which hit Australia over the weekend impacted mining and energy operations in the region, with reports stating some activities have been halted at BHP and Rio Tinto’s Pilbara mine. The mine is located in Western Australia and accounts for almost 40% of global iron ore production. The storms have now weakened to a category two, however there is no clarity on how long production will be halted and of any potential costs to the Australian economy. I hope you all had a good weekend. Only 4 weeks until we move into our new house and on Saturday my wife went out to dinner and casually mentioned our complete gutting and redesigning of our new place. She was asked whether we’d found room for a ‘wrapping room’? She tells me she looked very puzzled but apparently these are now a thing in some circles. Basically, it's a room dedicated to wrapping presents and its filled with built in rolls of gift paper hanging off the walls and a workstation in the middle with posh sellotape and ribbons of different varieties having their own special structured place. When my wife first told me I had images of a room where a hologram of Kanye West might emerge from the shadows. Anyway, I can’t imagine how many rooms I’d need to have to feel that such a room was the next cab off the ranks. Probably around 3000 rooms! However, I’d love to hear from any readers with a wrapping room or who knows of anyone with one! To stay with a rap, the mantra of last week was that “the Fed was dovish but the markets were sluggish!”. With volatility returning close to multi-year or all time lows in many assets classes in the first half of last week, the second half certainly jolted markets back to life. Firstly, the dovish Fed on Wednesday made people wonder what they saw in the future to make them so cautious. Yields collapsed and then Friday’s awful flash manufacturing PMIs in the core of Europe accelerated this and the US yield curve responded and inverted at more points on the curve, including some of those closely watched by the Fed. 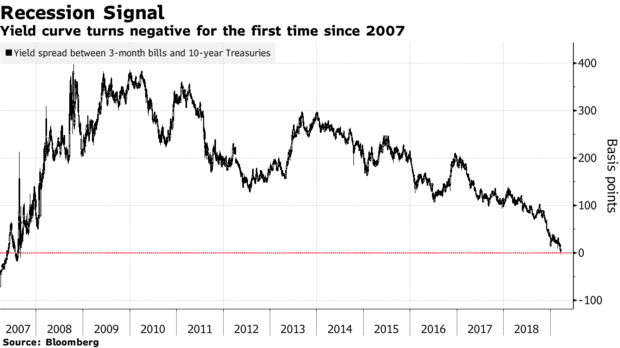 Indeed, the US 3m10y curve inverted for the first time since 2007 on Friday, and the spread between the 3m yield 18 months forward and the current 3m bill (an apparent favourite at the Fed) dropped to -25.9bps, its lowest level since 2008. The data and inversion led to the S&P 500 (-1.89%) experiencing its worst day since January 3, 2019. It’s worth reminding readers of our “Yield Curve 101” note from last December (click here ). Throughout my career the US YC has been by a long distance my favourite lead indicator of the US economy. This note shows that the most reliable indicator of a looming recession has actually been a 2s10s inversion. Last week this flattened -3.0bps (-0.9bps Friday) to 11.8bps (below 10bps at the intra-day lows), its flattest level since December. We still haven’t inverted yet and the lag between inversion and recession is usually 12-18 months. The problem is we are a bad session or two from doing so. As a reminder, we don’t care why the curve inverts but instead think that in a capitalist economy like the US, animal spirits - and with it economic growth - are very linked to the steepness of the curve. Before last week, our view was that the curve may invert in the second half of 2019 and elevate the risks of a recession in H2 2020. However, the move over the last few days increases the risks of both arising earlier even if we haven’t yet changed our view. There will be those who say that this time is different and indeed the Fed’s Evans said today in a speech in Hong Kong that there has been a secular decline in long-term interest rates and in such an environment it’s more natural for yield curves to be somewhat flatter than historically was the case. He added that the US labor market is extremely strong at present and he’s not worried about inflationary pressures increasing. To be fair, what happens next with US/China trade talks will probably have a big influence on the curve (and global growth) in the near term, so all eyes on US Trade Representative Lighthizer and Treasury Secretary Mnuchin trip to China for further talks on Thursday and Friday. For now though Asia markets are following Wall Street’s lead from Friday with the Nikkei (-3.10%), Hang Seng (-1.77%), Shanghai Comp (-1.38%) and Kospi (-1.76%) all trading in a sea of red alongside most markets. Elsewhere, futures on the S&P 500 are down -0.44% extending Friday’s declines, while, yields on 10y JGBs are down -1.2bps to -0.092% the lowest since September 2016, when the BoJ overhauled its monetary policy to focus less on asset purchases. 10yr USTs are broadly flat. Just before Asia opened, US Attorney General Barr said that Special Counsel Robert Mueller found no evidence of Trump colluding with Russia after his 22-month report on the matter was delivered late on Friday. The report did fail to exonerate President Trump on obstruction of justice even if the Attorney General said he didn’t find enough evidence to pursue an obstruction charge. This is clearly good news for the President but the battle will now be on how much gets released from the report. The Democrats will clearly be pushing hard to see the full report with the US House of Representatives Speaker Nancy Pelosi and Senate Democratic leader Chuck Schumer already saying in a joint statement that “Congress requires the full report and the underlying documents so that the committees can proceed with their independent work, including oversight and legislating to address any issues the Mueller report may raise.” Further, Jerrold Nadler, chairman of the House Judiciary Committee, has said in a tweet that, “in light of the very concerning discrepancies and final decision making at the Justice Department following the Special Counsel report, where Mueller did not exonerate the President, we will be calling Attorney General Barr in to testify.” So one to continue to watch. As for Brexit, the situation is very very fluid and MV3 probably won’t come this week if there is no chance of it passing. Instead, we may move onto to indicative votes either voluntarily or forced upon the government. MPs will debate Brexit today and a series of amendments are likely coming, which will surely include a vote on indicative votes. The UK weekend press was rife with speculation that Mrs May was close to being toppled with a caretaker PM expected to oversee Brexit negotiations. However, as Sunday progressed the names discussed as potential caretakers distanced themselves from the process and we’re no further along on knowing whether Mrs May will survive the week. Mrs May convened a gathering of many prominent Brexiteers and some cabinet members at her country retreat Chequers yesterday and we’ll likely know much more today if anything came of that. In the meantime, in a front page editorial today, the Sun newspaper has called on May to resign to help seal her deal and deliver Brexit. The Telegraph had also reported over the weekend that PM May is only prepared to set out a timetable for her resignation once she is sure that she had the votes to support her Brexit deal. Overnight, the Telegraph’s political reporter said that PM May is considering offering indicative votes on Brexit options including her deal, no deal, a 2nd referendum, revoking A50 and a FTA customs union and single market. Sterling is trading down (-0.11%) this morning after falling -0.66% last week. At the lows on Thursday, as no-deal risks increased, it was down -2.15% for the week. Back to Friday, now with the big news coming from the sharp downside surprise in the flash manufacturing European PMI data, which sparked a significant rally in global core rates and a selloff in equities. The Euro-area manufacturing PMI fell -1.7pts to 47.6, its lowest level since April 2012, being dragged down by the very weak print in Germany, where the manufacturing PMI fell -2.9pts to 44.7, the second lowest since 2009. The new orders sub-index did fall to a new post-crisis low at 40.1. Remarkably bad numbers. The composite euro area print fell -0.6pts to 51.3, which is consistent with quarterly growth around 0.15% qoq. That’s dangerously close to stalling speed, though it’s consistent with DB’s House View for Q1 growth of 0.1% qoq. France’s composite print fell -1.7pts to 48.7, dipping into contractionary territory with manufacturing -1.7pts to 49.8 and services -1.5pts to 48.7. Services in Germany and the Euro-Area held up well at 54.9 and 52.7 respectively so this is predominantly a manufacturing story for now. Can the recent mini China stimulus and upcoming trade talks save the day? Anyway the data made it a difficult week as the STOXX 600 fell -1.33% (-1.22% on Friday) and the DAX shed -2.75% (-1.61% Friday). Bund yields fell -9.8bps (-5.6bps Friday) to -0.02%, sliding below zero for their first time since October 2016. The drop in yields weighed on financials, with an index of bank stocks declining -4.52% (-3.05% Friday). The S&P 500 and NASDAQ marginally outperformed, shedding -0.77% and -0.60% (-1.89% and -2.50% Friday), respectively. Other core government bond markets benefited from the flight to safety, with 10-year yields in the US and UK falling -15.5bps and -19.7bps (-10.5bps and -5.0bps on Friday) on the week. One area of notable stress was in emerging markets, where an index of equities fell -2.93% on Friday for their worst session since October (-1.51% on the week). An index of EM currencies weakened -1.12% on the week, including -1.71% on Friday with losses led by the Turkish lira. The lira had its worst session since last August, depreciating -6.03% on Friday as the combination of slower European growth and evidence of capital outflows weakened the outlook. There are also suspicions that the central bank has been intervening to maintain the currency’s strength in recent weeks, and the CBT’s move to tighten liquidity by suspending its one-week repo auctions did not inspire confidence among investors. The one-week facility is nominally the main policy instrument, but officials steer financing into the more expensive overnight facility (at 25.5%) or the late liquidity window (27%) when they want to tighten conditions. The lira has recouped some of the Friday’s decline’s and is up +2.2% this morning with Turkey’s government announcing an investigation into JPMorgan and another probe of unspecified banks that the CBT reproached for stoking the lira’s Friday’s plunge. Back to the Fed and on Friday, President Trump announced his intention to nominate Stephen Moore as a Fed Governor. It will be interesting to see how he is received by the Senate and by other Fed leadership, considering he recently called for the entire Fed Board to “be thrown out for economic malpractice.” Whether or not this added to market nerves on Friday its hard to tell but it is certainly controversial. Believe it or not, the quarter draws to a close on Friday with a few interesting events on the agenda before it does. Outside of Brexit and the end of week trade talks mentioned earlier, we also have a number of central bank speakers, including ECB President Draghi (Wednesday), Federal Reserve Vice Chair Clarida and Vice Chair Quarles (both Thursday). Finally, a number of key data releases are expected, with the highlights including the German IFO surveys (today), Eurozone CPI data (Friday) and updated readings for Q4 GDP in the US (Thursday), UK (Friday) and France (Tuesday).